Can you use it like an MP3 player? How do we get to load whatsapp on this handset please. can anyone tell me are apps stored in internal memory or on the memory card in Firefox os phones??? Firefox auctioned the default search engine and Google won, having to pay half a billion dollars over five years. With all that money, you'd think they'd hire engineers and at least beat window's pace of delivery. Dont tried to fool me! Because its not Android(Google) worked for me! Chrispphunt, 05 Aug 2014All this mention od new OS's etc and no mention of BB10? kind of an oversight as it very good ... moreI agree BB10.2.1 etc is far better than Android or Apple as a stand alone OS - forget about the over rated apps emphasis by geek town for a moment and BB is a far better experience. Aways my favorite Firefox accept no less. All this mention od new OS's etc and no mention of BB10? kind of an oversight as it very good and much more mature than firfox in all areas by the looks of it. How offline app works now? "It is possible for HTML5 apps to be downloaded and installed locally. However, many apps are not 'packaged' (in Mozilla's terminology) and installable. The vast majority of apps are "hosted." In other words, they're webapps. The 'packaged' versions of the apps are, essentially, just websites zipped up in an archive. Which carries its own set of issues." 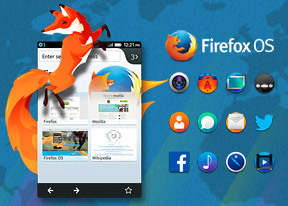 For phone OS that targets developing country, Firefox OS should support offline apps well. Internet connection still pricey on these countries. I'm not sure if the author of this review understood how Firefox OS works. The lack of actual apps is an advantage. With Android and iOS, you have to code them in a specific programming language and compile them to an executable, so they only work on that operating system. web technology on the other hand works on- and offline thanks to caching and local database storage and even on every OS. You'll need to adjust your website to responsive design for desktop and mobile display, but no hassle with an additional app. With HTML5 and JS, even offline games are possible. I love the philosophy. Even though i always use high end smartphones, i prefer to have as few apps as possible and just use mobile websites. Of course games and navigation won't work well as mobile websites any time soon. But other than that: screw the app. Give me a proper mobile site! Anonymous, 01 Aug 2014WTF are you talking about. Firefox had flash before Chrome existed. Firefox had Sync before C... moreLOL... Someone is still Thinking Firefox means "Browser"
Firefox will not win over new users if they (or rather their telecom partners) only keep selling mobiles in poorer countries. Imagine they finally open the marketplace to all countries and all you can find are millions of apps in Portuguese that are Brazil-specific. WebOS gone? i don't think so, LG's latest TV's come with it. > You can add more than one input language but the selection is pretty thin right now - Western Europe is somewhat covered but that's it (essentially Latin letters plus diacritics where necessary). This depends on the build you have Firefox OS f.e. also has Chinese / Japanese keyboards that work through composition, but the manufacturer of the phone has to enable them; as they eat valuable disk space because of the dictionary. > Those will run on an even less capable hardware - the bottom is set at an 800MHz processor and 256MB RAM. Anonymous, 01 Aug 2014IF Firefox focus on "Privacy & Security" they'll have a winner; if not, it will ... moreYeah will be nice if they can respect peoples privacy. And im all for keeping it fairly simple but i think they need to make it a little heavier, especially the browser need to be more advanced. I would like to see Boot2Gecko in a more high end phone as well, Full HD, 2GB RAM, 32GB storage + uSD, 13mp cam with LED flash. Anonymous, 01 Aug 2014WTF are you talking about. Firefox had flash before Chrome existed. Firefox had Sync before C... moreThis is about the phone, not your desktop browser. duhh..